Roblox is a multiplayer building and games platform featuring Lua scripting, originally launched in 2006. As the community continues to grow and evolve, our vision is to create a positive and constructive environment where everyone is welcome to share their passion for Roblox. 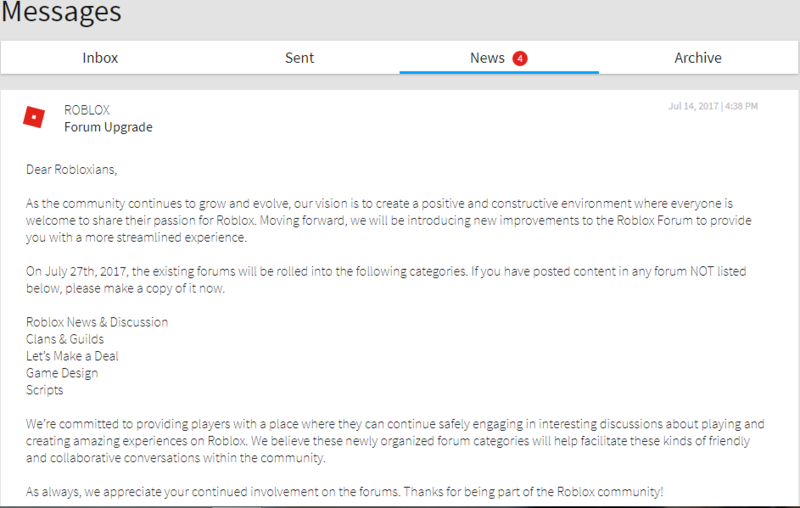 Moving forward, we will be introducing new improvements to the Roblox Forum to provide you with a more streamlined experience. On July 27th, 2017, the existing forums will be rolled into the following categories. If you have posted content in any forum NOT listed below, please make a copy of it now. We’re committed to providing players with a place where they can continue safely engaging in interesting discussions about playing and creating amazing experiences on Roblox. We believe these newly organized forum categories will help facilitate these kinds of friendly and collaborative conversations within the community. As always, we appreciate your continued involvement on the forums. Thanks for being part of the Roblox community! As the community continues to grow and evolve, our vision is to create an environment where everyone is welcome to share their passion for Roblox. The current structure for our Forums does not allow us to maintain the high standards that we feel are so important for nurturing a constructive and positive environment. There are groups that are available to serve as places for discussion and collaboration on any topic or interest. You can even create a new group for any topic that doesn't exist yet. You can search for a group here: https://www.roblox.com/groups/join or create new groups here: https://www.roblox.com/groups/create. You can also advertise your group to engage with others with your interests. We’re committed to providing players with a place where they can continue safely engaging in interesting discussions about playing and creating amazing experiences on Roblox. This coming year, we'll be investigating options to re-build forums that better serve you, our community, and our goals in providing a safe and constructive environment. As of today, the Forums will be read-only. Please save any content that you might want to keep as these public forums will be closed on Monday, December 11, 2017. This page was last edited on 25 December 2017, at 01:10.